RIVER SHOALS is located only 6 minutes from downtown HELEN, GA. Nestled on 6+ acres of PRIVATE land with 300 feet on the Chattahoochee River and surrounded by nature. RIVER SHOALS is the perfect getaway! Kick back on the river with multiple large decks, including a private one right off the master bedroom! ENJOY the large Picnic area, right along the side of the river, available just for you with a SWING and TABLE, along a stone pathway that goes right to the river! Outdoor area for badminton, bean bag toss, horseshoes, etc. Lose track of time while kayaking, trout fishing, gazing at the stars or just enjoying the sound of the shoals while lounging on the deck in this bit of paradise. 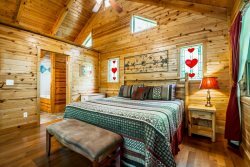 This Cabin has a HOT TUB, Charcoal GRILL, Gas Grill, it features two surround sound systems, two flat screen TVs, two gas fireplaces, an outdoor fire pit, and a FULL SIZE POOL TABLE! ALL for your constant enjoyment. VERY PRIVATE and very spacious with extra sleeping areas. This cabin is LUXURIOUS and is sure to please even the most frequent of cabin visitors. Up to date and well maintained makes staying here a breeze and money well spent. Book Now! This one goes fast. Dist. from Helen: 13 min. Minimum booking age is 29: No exceptions. Fire Wood Available for Delivery. Ask the Office!